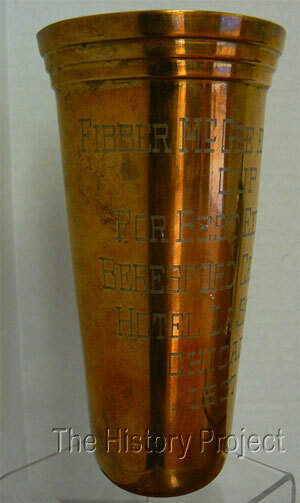 Description A 6" cup, engraved "Fibber McGee and Molly Cup, For Best Exhibit, Beresford Cat Show, Hotel La Salle, Chicago, 1937"
presented at the Beresford Cat Show, Chicago, IL. The Beresford Cat Club of America, Inc. was formed in Chicago in 1899 and quickly rose to prominence. The club was named after noted British breeder Lady Marcus Beresford, who had founded 'The Cat Club' registry in England in 1898. Beresford held its first show in January, 1900, reportedly awarding 176 prizes1. The engraved metal cup stands 6" tall and was the award "For Best Exhibit" at the Beresford Cat Club show held at the LaSalle Hotel, Chicago, in 1937.
Who were Fibber McGee and Molly? Jim Jordan (1896-1988) and his wife Marian Driscoll (1898-1961) originated the comedy show, 'Fibber McGee and Molly', on an NBC affiliated radio station in Chicago in 1935. The show was instantly popular and, in various lengths and renditions, remained on the air until 1959.